We’ve put together an archive of some resources you may find useful, please contact us if you would like to find out more. Find in depth technical information on GRW Bearings and bearing Assemblies. Find in depth technical information on GRW Duplex Bearings and Assemblies. A ball race is a precision instrument that has been manufactured under highly controlled conditions. This guide provides procedures to ensure you get the maximum benefit from your bearings. Find out more about GRW Spindle / Angular Contact bearings. 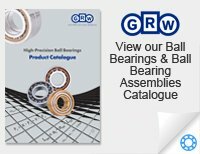 Find out more about GRW Ball Bearing Units and Assemblies. Perfect performance demands material of the highest quality. The professional selection of raw materials, parts and components enables GRW to constantly provide our customers with consistently high quality. GRW ball bearings are made of chrome steel (100Cr6), stainless steel (X65Cr13 or X105CrMo17), or high corrosion resistant steel (X30CrMoN15-1). Similar load ratings are achieved for all these steel types following ISO and AFBMA standards. It has always been GRW policy to choose the most advanced material available – for example the alloy SV30. It uses the constituents Nitrogen, Carbon, Chrome and Molybdenum in a new type of alloy composition. Ceramic balls, e.g. for hybrid ball bearings with steel rings, can be used in addition to exceed the boundary conditions of ball bearing applications. Find out more about GRW’s Xtra Coat Bearing and bearing Assembly lubricant can reduce friction by up to 30%. Find out more about how GRW’s Xtra Coat Bearing and bearing Assembly lubricant can reduce friction by up to 30%. See how GRW Bearings can be applied up to ultra high vacuum (UHV) and at a temperature range from -270°C to +400°C. Find out more about GRW bearing and bearing assembly applications in Defence, Space and Aerospace. GRW bearing steel SV30 provides perfect performance even at small dimensions. The SV30 alloy benefits include improved alternating bending strength, elongation at rupture, high temperature resistance, toughness and chemical resistance. SV30 is well ahead of all ball-bearing steels used in production to date. Highlighting GRW’s commitment to Quality in all areas. As part of GRW’s commitment to Quality, a quality management system is in place to meet DIN EN ISO 9001. GRW’s quality management system has been assessed and certified by independent, internationally recognised institutions, please click the links below to view these certifications. 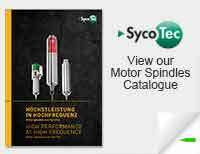 Find in depth technical information on SycoTec Motor Spindles and Accessories. 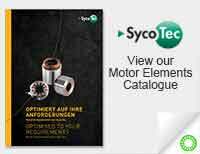 Find in depth technical information on SycoTec Motor Elements and Accessories.